Discover an ancient Himalayan kingdom, closed off from the world for centuries, shrouded in myths and legends. Walk to remote gold-roofed temples and monasteries, and hike up steep slopes across windswept meadows filled with wildflowers. 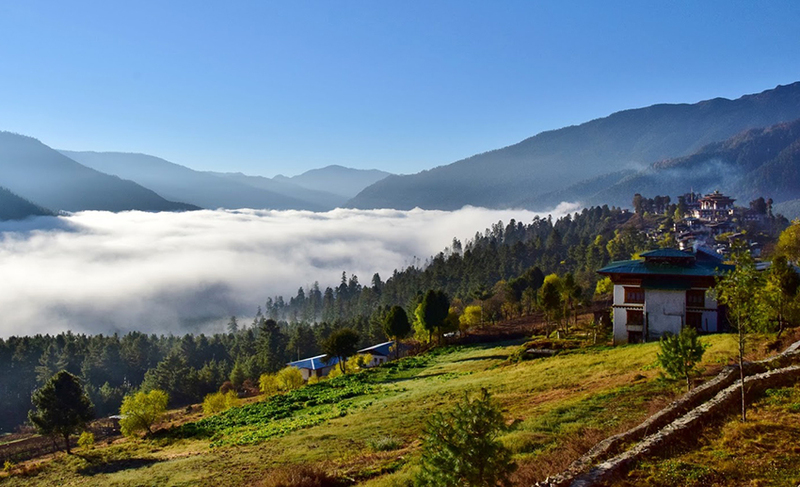 Visit lively villages in emerald valleys surrounded by spectacular Himalayan scenery. Learn about local culture, enjoy local culinary delicacies, and take part in an evening of traditional song and dance. The flight to Paro on a clear day is one of the most spectacular of all mountain flights. Whether flying along the Himalayan range from Kathmandu or over the foothills from Kolkata, the journey offers breathtaking views and an exciting descent into the Kingdom. You will be met by our representative at the airport and transferred to your hotel. Depending upon your flight arrival time in Paro, you can take an afternoon visit to Ta Dzong. Once a watchtower, built to defend Rinpung Dzong during inter-valley wars of the 17th century, Ta Dzong was inaugurated as Bhutan’s National Museum in 1968. 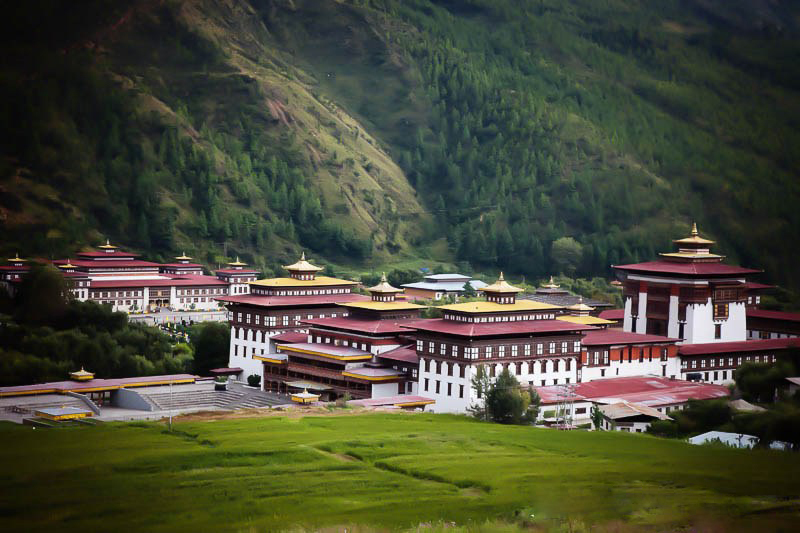 It holds a fascinating collection of art, relics, religious thangka paintings and Bhutan’s exquisite postage stamps. Then, take a stroll down a hillside trail to visit Rinpung Dzong, which has a long and fascinating history. Built in 1646 by Zhabdrung Ngawang Namgyal, the first spiritual and temporal ruler of Bhutan, the Dzong houses the monastic body of Paro, the office of the Dzongda (district administrative head) and Thrimpon (judge) of Paro district. It is also the venue of Paro Tshechu, held once a year in the spring. Later if time permits, take a walk along a trail through the fields, and visit Lango village. 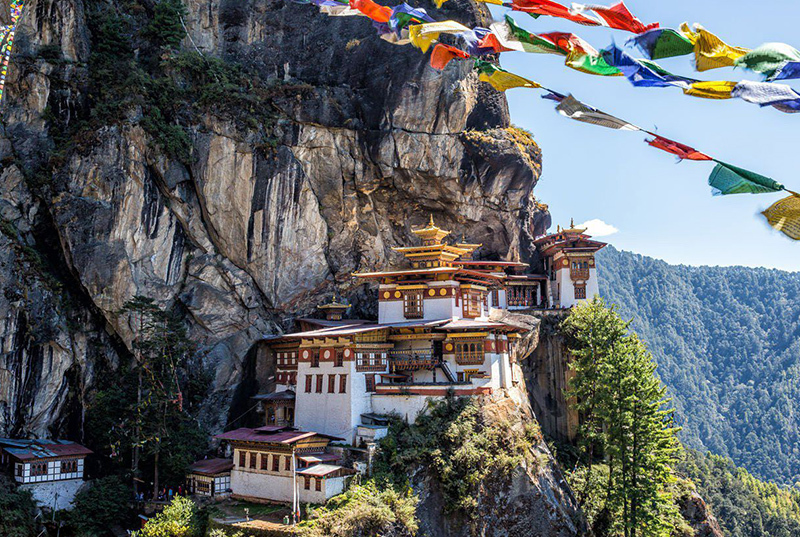 Following breakfast, take an excursion to the iconic Taktsang Monastery, or Tiger’s Nest as it is commonly known, Bhutan’s most famous landmark and holy site. 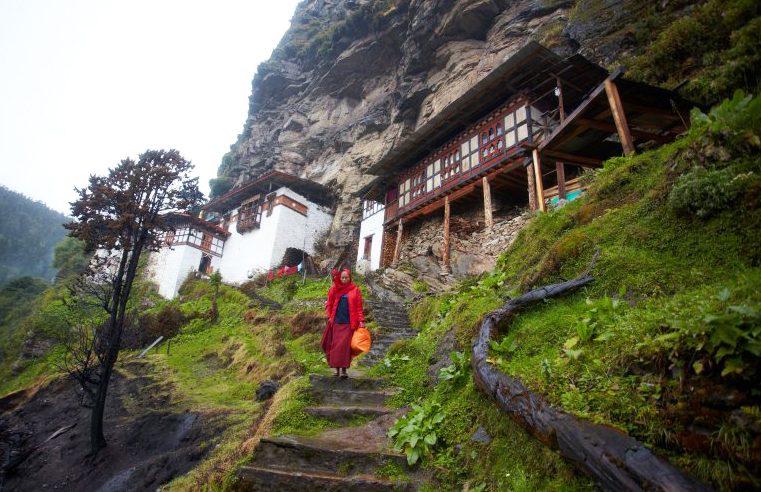 This incredible monastery clings to the side of a cliff 900m above the Paro valley floor. 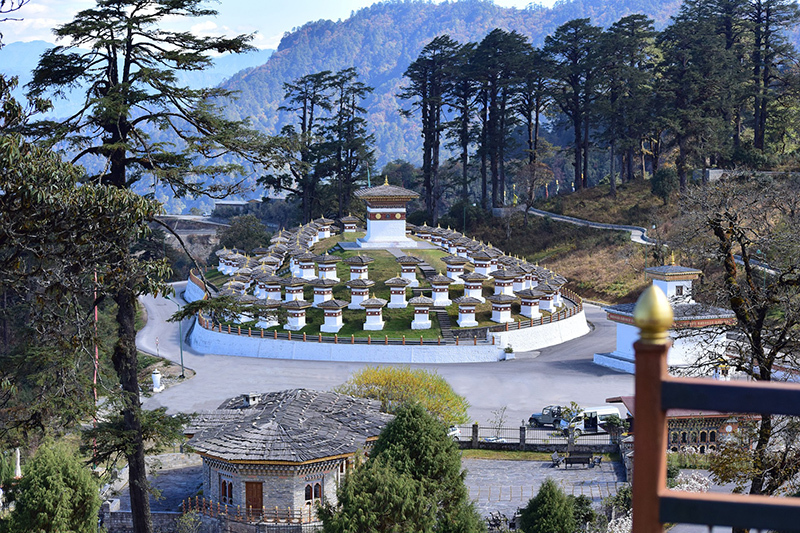 It was built in the 1600s at the site of a cave where Guru Padmasambhava had meditated in the 7th century – legend holds that he arrived here on the back of a tigress and meditated in the cave. On 19 April, 1998, a fire severely damaged the main structure of building but now this Bhutanese jewel has been restored to its original splendor. The walk is around 5 hours round trip. In the late afternoon, drive to the further end of the valley to the base of Drukgyel Dzong. The ruins of Drukgyel Dzong sit about 14km outside of Paro town. Built in 1649 by Zhabdrung Ngawang Namgyal, the dzong is thought to have been constructed to commemorate Bhutan’s victory over invading Tibetan/Mongolian forces. The word ‘Druk’ means Bhutan and ‘Gyel’ means victory. Sadly the dzong was destroyed by fire in 1951, but its ruins still hold great historical significance to the Bhutanese people. Here you can also see beautiful traditional farm houses, nicely painted. 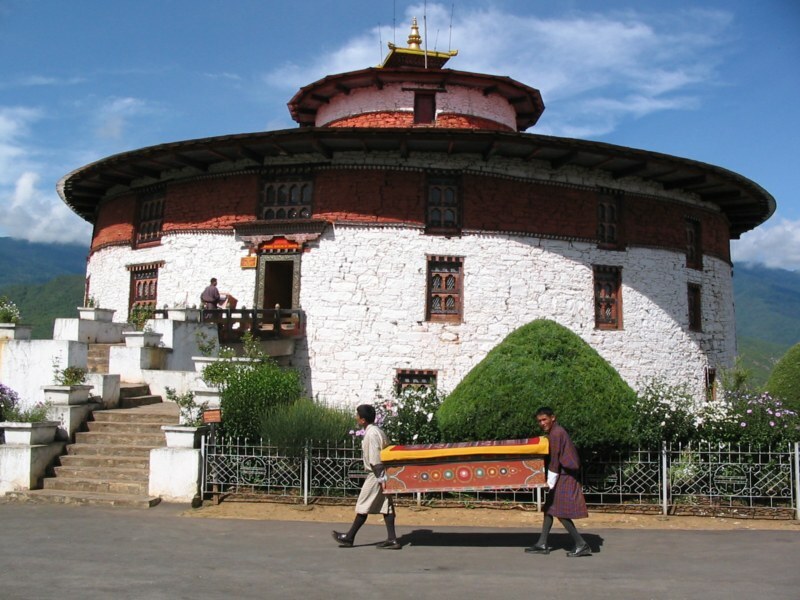 On the drive towards Paro town visit Kyichu Lhakhang, one of the oldest and most beautiful temples in the country. Legend holds that a giant demon had covered Tibet and all of the surrounding areas with her body, thus preventing the spread of Buddhism. The Tibetan King Songsten Gampo decided to erect a temple at each one of the demon’s joints, preventing her from moving, thus allowing Buddhism to grow and flourish in the region. It is said that Gampo magically multiplied himself and sent out his emanations to various areas across the region to erect 108 temples in just one single day. Kyichu Lhakhang is considered to be one of them. In the morning set out by car for Haa Valley, taking a short stop at Chelela pass along the way. Located at an elevation of 3,988m, Chelela is considered to be one of the highest motorable passes in Bhutan. The pass offers stunning views of the sacred mountain Jomolhari and Jichu Drake, and is marked by hundreds of prayer flags fluttering in the wind. From Chelela, embark on an excursion to Kila Gompa, a nunnery perched on a steep cliff face at 3500m. This staggering site manages to house 7 small temples and about 70 nuns. From Chelela pass, the Gompa is about an hour walk in a magnificent wooded area. After lunch at Chelela pass, continue driving onward to Haa Valley. The Haa Valley was opened for the first time to foreign tourists in 2002. 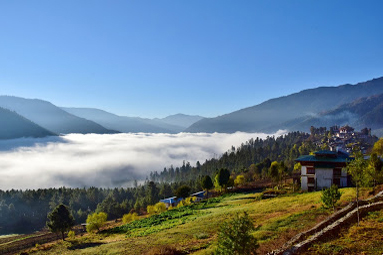 Also known as the “Hidden-Land Rice Valley”, it is a culturally rich area and is home to the 7th century Lhakhang Karpo, and Lhakhang Nagpo, situated at the foothills of three mountains known as Meri Puensum. The Valley of Haa lies on the western most edge of Bhutan, its northern boundaries with the Chumbi Valley of Tibet dividing it from the Indian province of Sikkim. 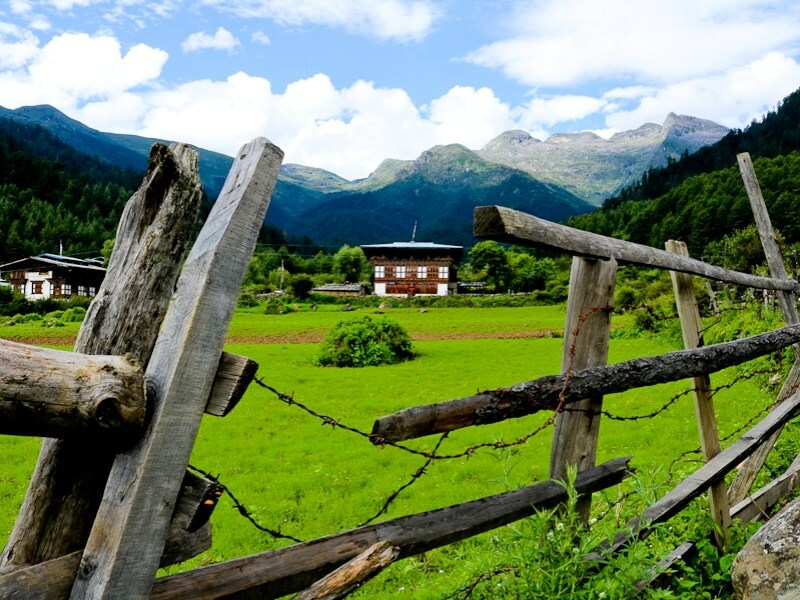 Haa is one of the 20 districts or dzongkhags of Bhutan and is one of the least populated. 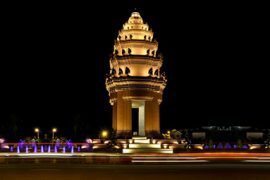 Most of its landmass is covered by dense forest and the remainder under fields of wheat and barley, with a little rice towards its lower reaches and the accessible side valleys. In the evening explore the town and its market area. After breakfast, visit Lhakhang Karpo (White temple), established in the 7th century by Tibetan King Songtsen Gempo. 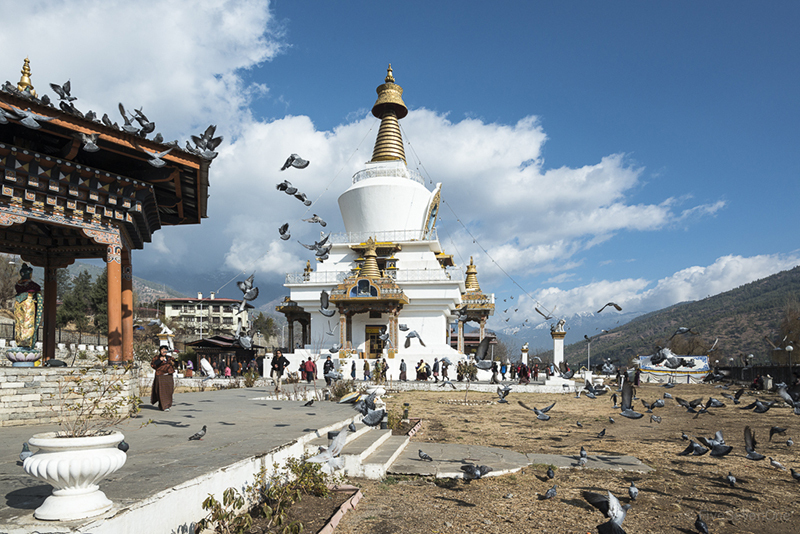 According to legends, one black and one white pigeon were released to select the site for temples and the white pigeon landed on the foothills of the three towering mountains worshipped as ‘Rigsum gonpo’ and is where this temple stands today. Then visit, Lhakhang Nagpo (Black temple), built in the 7th century by Tibetan King Songtsen Gempo and situated towards the north of Lhakhang Karpo. Lhakhang Nagpo serves as the seat for the guardian deity ‘Da Do Chen’. The principal relic of the monastery is the Choe-Lung-Truel Sum. Both these temples stand as the guardian sentinels keeping watch at the south entrance of Haa Valley. Afterwards, begin your trek by walking through the lower village of Lechuna and continue down to the Haa Chhu (river) before crossing a quaint wooden bridge. From here the walk to the Jamte Gompa is a gradual ascent of not more than 1.5 hours through pristine forest, which later opens up to the village. Visit the 300-year-old plus monastery, and then pay a visit to a local farmer’s house for a cup of tea and ‘zau’. The views of the southern Haa valley can be enjoyed best from here. After the tea break we will take a seldom used animal track that connects onto to the main trail after about half an hour and continue on to the Chumpa bridge to stop for a picnic lunch beside the river. After lunch we walk slowly through the beautiful Chuma village taking time to see the villagers at work and even have some interaction. Walking along the village path, we continue on to our lodge in time for high tea. Total walking time about 4-5 hours. For those who are interested in more time exploring the Lechuna village, our guide can accompany them. Note: the monastery visited in the today’s activity is currently undergoing renovation work due to earthquake damage. 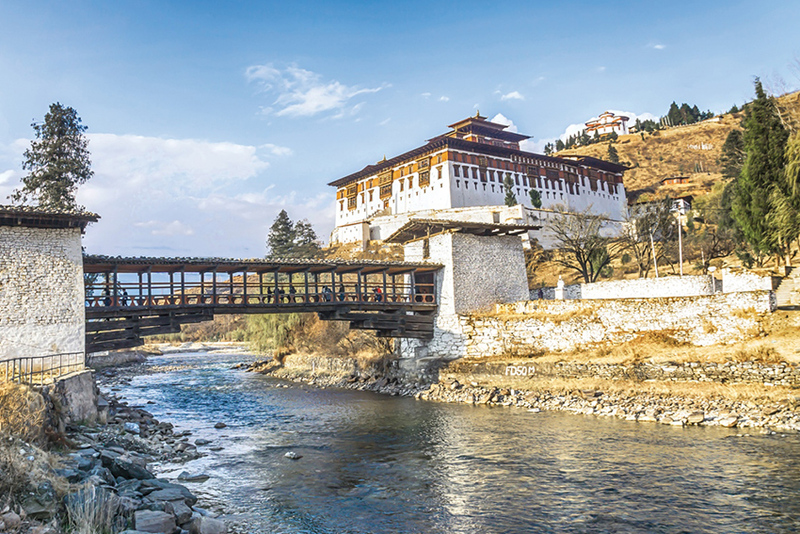 Today we’ll drive to Bhutan’s capital town Thimphu, stopping along the way at Dogar Dobji Dzong, a 16th century structure built by the brother of the Divine Madman, Drukpa Kinley. Legend has it that the statue of the Guru Landrachen housed here, complained when the apostate Tibetan monarch Langdharma tried to smash it with a hammer. This dzong became Bhutan’s first jail in 1976, but has since returned to its monastic origins. Drive onwards, stopping en route at Chuzom, the confluence of Paro and Thimphu rivers. 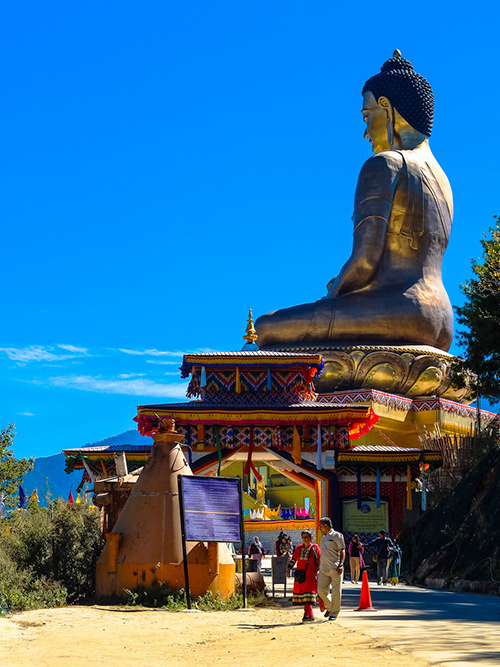 The capital town of Bhutan and the centre of government, religion and commerce, Thimphu is a unique city with unusual mixture of modern development alongside ancient traditions. Home to civil servants, expatriates and monk body, Thimphu maintains a strong national character in its architectural style. Besides its position as the seat of government, its many glittering monuments, temples, monasteries, dzongs, premier museums and institutions make it an important destination for travelers. In the afternoon, visit Buddha Point (Kuensel Phodrang). You can pay your respects and offer prayers to the Buddha, the largest statue in the country, and then walk around and take a glimpse of the valley. Later, drive to Tashichho Dzong. This impressive fortress/monastery houses Secretariat building, the throne room of His Majesty, the King and various government offices. It is also the summer residence of Chief Abbot and central monk body. In the evening take an exploratory walk around Thimphu main street and market area. Also visit the Local Crafts Bazaar, to browse through example of Bhutan’s fine traditional arts. Here you can buy hand-woven textiles, thangka paintings, masks, ceramics, slate and wood carvings, jewellery, interesting items made from local materials. In the morning after breakfast, drive to the Takin Preserve. 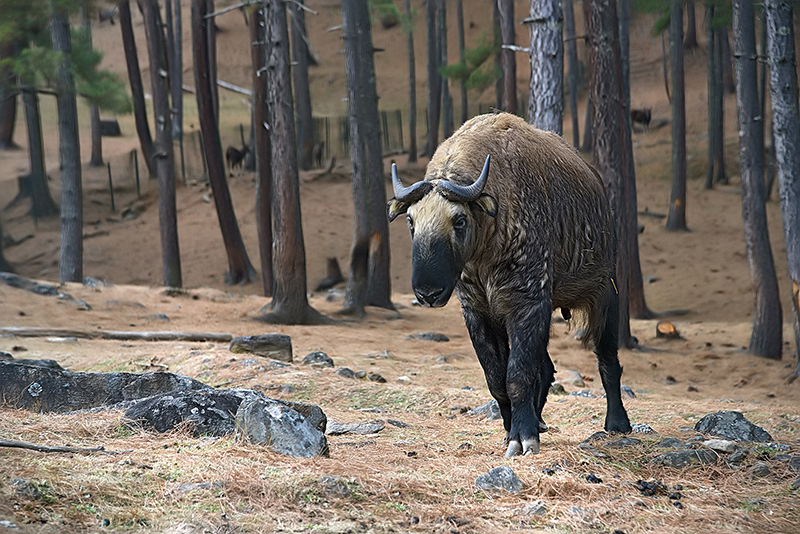 Popularly known as Motithang Zoo, the preserve houses takin, the national animal of Bhutan. The takin is an extremely rare bovid mammal of the ovine-caprine family. Apart from takin, the preserve is also home to sambars and barking deers rescued from different parts of the country. Next visit the National Memorial Chorten, a monument for world peace and prosperity. The paintings and statues inside the monument provide a deep insight into Buddhist philosophy. Afterwards drive up to the Dochula pass (3,088m), stopping briefly to take in the view and admire the chorten, mani wall, and prayer flags which decorate the highest point on the road. If skies are clear, several towering peaks can be seen from this pass, including Masagang (7,158m), Tsendagang (6,960m), Terigang (7,060m), Jejegangphugang (7,158 m), Kangphugang (7,170m), Zongphugang (7, 060 m), a table mountain that dominates the isolated region of Lunana, and finally Gangkar Puensum, the highest peak in Bhutan (7,497m). From Dochula, take a trek to Lungchuzekha Goemba. It is an interesting three hour round trip walk, offering excellent views of Bhutan’s Himalayas. The road ascends gradually into white, red and pink rhododendron forests for about one and a half hours with some steep sections before branching left to Lungchuzekha Goemba. The highlight of this excursion is the beautiful forest, spectacular mountain views and monastery. Afterwards, drive onward to Punakha / Wangdue. Punakha served as the capital of Bhutan and seat of government until 1955 and still it is the winter seat of Je Khenpo (the chief abbot). Linked to some of the most momentous events in Bhutanese history, in 1651 Punakha was chosen to be the capital and two and half centuries later, in 1907, Punakha was, again the place where Bhutanese people elected the first king, Gongsar Ugyen Wangchuk. Blessed with temperate climate and owing to its natural drainage from Pho Chhu (male) and Mo Chhu (female) rivers, the fertile Punakha valley produces abundant crops and fruits. Nearby Punakha, Wangdue Phodrang is the last town on the central highway before central Bhutan. The town is not more than an enlarged village with a few well-provided shops. Located in the south of Punakha, the higher reaches of the Wangdue Phodrang valley provide rich pastureland for cattle. 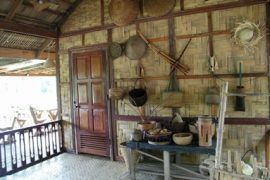 This district is also famous for its fine bamboo products, slate and stone carvings. 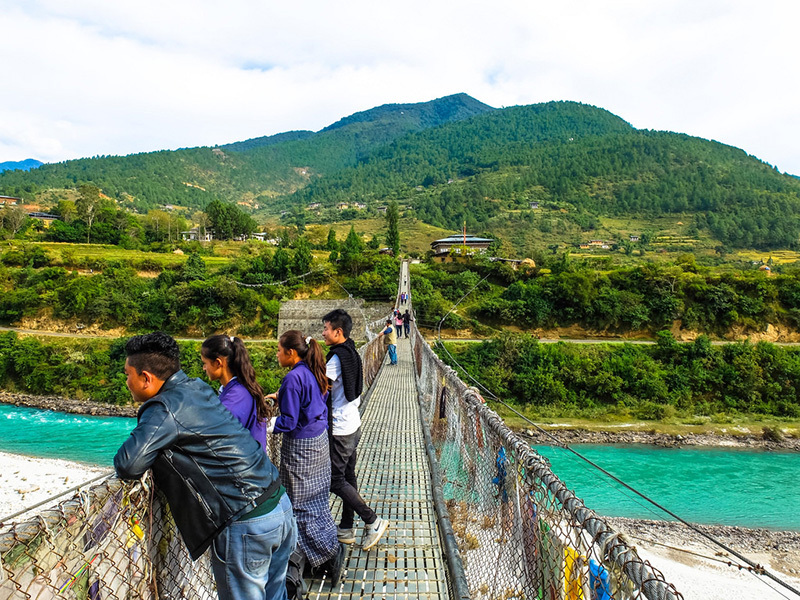 After breakfast travel by car to the Punakha Dzong, and enjoy a walk across a suspension bridge (about 200m long) with a wonderful fresh breeze and a fascinating view of the Dzong. Built strategically at the junction of Pho Chhu and Mo Chhu rivers in 1637 by Zhabdrung Ngawang Namgyal to serve as the religious and administrative centre of the region, Punakha Dzong has played an important role in Bhutan’s history. Punakha was the country’s first capital, and the Dzong has hosted the coronation ceremonies for each of its Kings. This lovely Dzong, widely thought to be the most beautiful in the country, is also the winter residence of the Central Monastic Body. After visiting the Dzong, begin trekking to Limbukha village, following the farm houses gradually climbing towards Dompala hills. The view of the Dzong, Pho Chhu, Mo Chhu rivers and surrounding village is superb amidst chirpine forests. The climb is another two 2.5 hours to Limbukha. Farmers here grow Bhutan’s famous red rice which is supposed to have medicinal values. This particular rice needs clean mountain spring water so that the taste is good and its nutritional value is maintained. Limbukha is also known for its love of peace and tranquility. Legend holds that during medieval wars the “limpus” or the people of Limbukha, always volunteered as peace negotiators. This is also depicted during the yearly festival called ‘Serda’ when the men are found carrying peace flags instead of swords and fireworks. In the evening, take a short walk to Chimi Lhakhang. Perched on a small hill in the centre of Punakha Valley, Chimi Lhakhang is dedicated to Lama Drukpa Kunley, affectionately known as ‘The Divine Madman’, who in the late 15th century used humour, songs and outrageous behaviour to dramatize his teachings. It is also known as a temple of fertility, and it is widely believed that if couples wishing to conceive pray here they will be blessed with a child. It is about 30-minute walk across a field from the road to the temple. In the morning visit Rinchengang Village, a small clustered village in Wangdue Phodrang, about a 20 minute hike uphill from the nearest road. Afterwards you’ll drive to Gangtey. The valley of Gangtey is one of the most beautiful spots in Bhutan. In the afternoon visit Gangtey Goemba. Perched on a small hill that rises from the valley floor, the Gangtey Monastery is the largest Nyingmapa monastery in Bhutan. It is surrounded by a large village inhabited mainly by the families of the 140 Gomchens who take care of the Monastery. A few kilometers beyond the Gangtey Monastery, on the valley floor is the village of Phobjikha. This is the winter home of black necked cranes that migrate from the arid plains in the north to pass the winter in a milder climate. Phobjikha, at an altitude of 2900m, falls under the district of Wangduephodrang and lies on the periphery of the Black Mountain National Park. Explore Phobjikha valley on foot. After breakfast, we’ll begin our walk for the day. Start with an easy walk of about 1.5 hours to reach our first village, Kilkhorthang, which has about nine households and a lovely temple. Continue along a farm road for about half an hour, reaching a vista point where you can see distant villages in the Phobjikha Valley. From this wonderful viewing point, we continue towards Tanjey, enjoying fantastic views of the surrounding villages and farmers working in their fields, finally arriving at picturesque village of Tanjey after about an hour. We’ll visit the village temple, and then make our way back to the guest house for a late lunch with a special Bhutanese dish of Kewa Datsi (local potatoes with cheese) and red- rice. For those interested, you can have the opportunity to celebrate this wonderful hike with a local traditional drink known as ARA (distilled liquor similar to Japanese sake) – a good way to end the day with a local touch in this beautiful valley. Travel by car after breakfast to Lhongmay, a roadside village with about 5 households. From here we’ll leave the car behind and follow a trail through bamboo thickets and across a small wooden bridge next to a tiny chorten, and gradually up to the village of Lhongtey, with 6 homes all facing towards the East for the early sunlight and its warmth. We then climb up gradually and continue our journey through the village towards the Gyeche La Pass (3590m). The trail that we are hiking was used in the olden days by the natives of Gangtey and Sephu for trading and moving yaks to higher grazing meadows during the winter months. You’ll encounter a wide range of vegetation on this hike, including blue pine, dwarf bamboos, maple, larch, rhododendron, birch, oak, spruce, hemlock and juniper and some Rosa species. After about 2-2.5hrs of gradual to steep climbing through this pristine mixed forest, we reach Gyeche La Pass, which is marked by a stone structure with prayer flags. The view from here of Phobjikha Valley and its monastery Gangtey Gompa is absolutely breathtaking. For those who have knee problems, please be cautious with every step you take. Walking sticks will be highly recommended on this trail. Once we happily complete our descent to the bottom after about three quarter of an hour, we make a stop at a monastery – a tranquil setting for meditation, with the cliffs as a backdrop. As we continue along a dirt road, you will notice that the valley widens and offers more scenic views of the Black Mountains and local villages. The valley of Phobjikha is also a home to the rare species of Black Necked Cranes, where they dwell during the winter months (beginning of November – beginning of March). So, if you’re hiking during these months please look out for this rare and gorgeous bird feeding in the fields. After a short hike through the pine forest, our vehicle waits for us above the monastery to take us to our lodge, which is about a 30 minute ride down in the valley. Today we will travel by car from Gangtey to Paro, stopping along the way to visit the newly developed Wangdue Phodrang town. Drive further ahead and visit Simtokha Dzong, the oldest fortress of the country which now houses the School for Buddhist studies. While entering to Paro valley visit the Tamchoe Monastery, built in the 14th century. Enjoy the evening at leisure in and around Paro city centre. Following breakfast, transfer to the airport for your flight to your next destination.